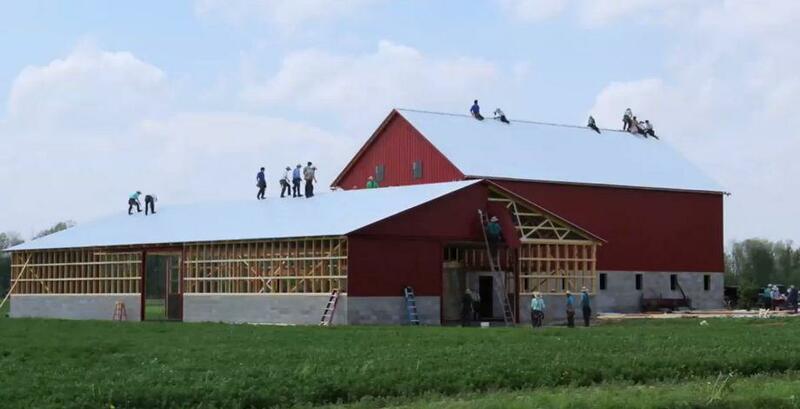 Watch an Ohio Amish community raise a barn in less than 10 hours (VIDEO). An Amish community in Ohio raised a barn in less than 10 hours last spring in a volunteer building practice that was common in the 18th and 19th centuries. In 18th- and 19th-century rural North America, barn-raising was a thing. But these days the Amish are among the last communities to carry on this mostly forgotten tradition in which neighbors volunteered their time and labor to helping one another build barns. Modern construction is generally held hostage by the whims, bloated budgets, and protracted time frames of the construction industry. Perhaps that’s one reason why this 3½-minute time-lapse video shot by Scott Miller of an Ohio barn being raised by a community of industrious Amish in less than 10 hours is such a thrilling visual testament to the power of teamwork.